This hymn has by some been attributed to Thomas Aquinas; Dr. Schaff thinks erroneously. He regards it as belonging to the fourteenth century, the author unknown. a fount of love thou art! Ray Palmer, in: The Poetical Works of Ray Palmer, 1876, 108. 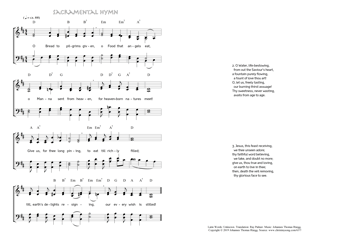 Translated from the above mentioned Latin hymn. Diese Seite - www.christmysong.com/637/index.html - wurde zuletzt wesentlich bearbeitet am 10.04.2019.